Glorin Hair Moisturizer is a revolutionary hair moisturizer formulated with Vitamin B-5 and humectan..
Glorin Hair Spray fixes the hair in a uniform way, giving it a silky, soft, shiny and manageable. Ab.. Non greasy super hold gel that gives hair volume and hair seting power. Easy to wash off. 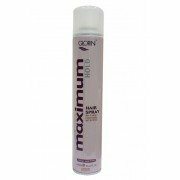 Content..
Glorin super hold gel gives hair volume and strength. Easy to wash off. Content : 330ml .. It is the perfect styling aid for the latest trend. It moisturizes and revitalizes your hair giving ..